Students walk between classes on a campus in New York on February 1, 2017. For every $1 accreditors spend measuring college quality, they provide colleges access to $1,693 in federal dollars. It should be no surprise that access to federal dollars is not secure if accreditors spend little to nothing on gatekeeping. America’s current system for safeguarding the billions spent on federal student aid is not up to the task. It should be no surprise that access to federal higher education dollars for financial aid is not secure if accreditors have little to spend on gatekeeping. America’s system for safeguarding the billions of dollars spent on federal student aid is not up to the task. The federal government spends roughly $120 billion annually in federal financial aid dollars to help students afford college.1 But the government alone does not determine which colleges get access to this money. Instead, it relies on a group of private nonprofit organizations, known as accreditation agencies, to serve as gatekeepers to federal funds. Before a college can access federal financial aid, an accrediting agency must provide a stamp of approval indicating that the college is of sufficient quality. This report takes a closer look at a key underexamined issue: the money spent on quality assurance. To do that, this paper explores the issue of spending on accreditation through the lens of both the agencies involved and the schools they oversee. From the agency side, the Center for American Progress analyzed tax filings of the 12 major institutional accrediting agencies to see how much they take in and spend compared to the federal aid dollars granted to institutions they oversee. For the institution side, CAP looked at their costs in terms of the dues and fee structures of these same agencies to understand why and how these costs vary by school. CAP’s findings raise questions about whether spending on quality assurance is sufficient to conduct proper oversight. At less than 1 percent of federal student aid dollars, overall spending on quality assurance pales in comparison to the amount of money flowing from the U.S. Department of Education. Second, the findings reveal dramatic variation in what different accreditors require colleges to spend, resulting in differing amounts of available revenue for agencies. Lastly, membership dues and fees for services—accreditors’ largest source of revenue—bear a minimal relationship to college performance or the level of oversight needed. Accrediting agencies are under fire for failing to safeguard students and taxpayer dollars. But these findings suggest that at least part of that blame falls directly on the shoulders of the federal government for not properly ensuring accreditors have sufficient resources to do their jobs. It should be no surprise that access to federal dollars is not secure if accreditors spend little to nothing on gatekeeping and instead rely on colleges to pay for their own oversight. Set minimum fees: Accreditors should work together to set minimum fees for initial accreditation, reaffirmation of accreditation, and other fees. Greater alignment among fees would ensure that agencies are charging enough to properly carry out their work. Increase fees for poor performers: Accreditors should vary annual fee amounts based upon institutional performance. Schools that struggle require more attention and resources to help them improve. That cost should be reflected in what they pay for oversight. Increase consideration of staffing and financial resources during U.S. Department of Education accreditor reviews: Government reviews of accreditors should pay greater attention to staffing levels to determine if these agencies have enough employees to adequately carry out their responsibilities. Although the current review process for accreditors is supposed to take this into account, accreditors’ lack of resources suggests staffing needs are falling short. Enhance accreditor legal protections: Accreditors should receive greater legal protections from lawsuits. One danger with insufficient resources is that accreditors may not be able to afford the cost of legal representation, making them reluctant to hold schools accountable for fear of ending up in court. Greater legal protections for accreditors in the courts—while preserving due process rights for schools—would allow accreditors to maintain adequate resources for quality improvement. The time is long overdue to rethink the nation’s investment in the agencies tasked with the job of college oversight, to consider whether their funding is adequate for the job of gatekeeping, and to ensure that resources are targeted toward the colleges that are most in need of improvement. Accrediting agencies are independent, nonprofit membership associations that serve as the gatekeepers guarding federal student aid dollars. For a college’s students to access federal financial aid, the school must first be approved by an accrediting agency that has obtained recognition from the U.S. Department of Education. The Department of Education recognizes 37 accrediting agencies that fall in one of three categories.6 The first and largest group in terms of institutions and students covered consists of seven regional accreditors, which oversee schools based on their geographic location. For example, the Northwest Commission on Colleges and Universities, or NWCCU, oversees colleges in the Pacific Northwest. The majority of schools that regional agencies oversee are public and private nonprofit colleges. The second largest group consists of five national accrediting agencies, which oversee colleges nationwide but tend to have a career focus and include mostly private for-profit colleges. A third group, programmatic accreditors, is not relevant here because its members oversee specific programs but are not typically gatekeepers of federal funds for the majority of colleges they oversee. Regional and national accreditors set standards colleges must meet in order to be accredited. While these standards vary by agency, federal law requires accreditors to have criteria that address certain topics, including facilities, faculty, finances, and student outcomes.7 Once accredited, colleges must go through a periodic review to prove they are in compliance before getting renewed or reaffirmed. Reaffirmation cycles can vary from a few years to a maximum of 10 years. Today’s quality assurance system, in which institutions of higher education pay for their own gatekeeping costs, reflects the messy process whereby a system designed more than 100 years ago for one purpose was adapted for a new and bigger federal role in the mid-20th century. Accrediting agencies long predate the creation of the federal aid programs. Colleges themselves created the accreditation agencies in the late 1800s to establish, through a peer review process, standards around curriculum, degrees, and transfer of credits.8 At the time, colleges lacked universal standards on admissions requirements, curricula, and time to degree, which made it difficult to compare differences between programs and degrees.9 Different standards complicated the completion of basic tasks, such as determining how many credits a school should accept when a student transferred institutions or whether foreign students were qualified for admission.10 Since accrediting agencies were voluntary membership organizations, colleges that chose to participate funded the accreditors through membership dues and fees. In relying on accreditors to protect financial aid dollars, Congress took agencies that were focused on one thing—verifying quality for self-regulation—and turned them into a pseudo-regulatory arm of the federal government. As part of their expanding role, accreditors added new federal requirements to their list of duties, such as assessing a college’s financial responsibility score as measured by the U.S. Department of Education, on top of their prior functions. But at their core, these agencies remained membership associations dependent on colleges for income. Despite all these changes to accreditation over time, one key element remains the same: Accreditation agencies are membership organizations at heart. Despite the growing legal and regulatory demands on accrediting agencies, the federal government does not pay accreditors for their oversight service. Instead, accreditors’ viability completely relies on funds received from the colleges they oversee. As a result, accreditors collect and spend very little compared to the billions of dollars in the aid programs. To get a sense of the resources and spending picture at accreditation agencies, the Center for American Progress analyzed federal tax documents, known as Form 990s, that accreditors are required to submit each year. These forms contain information on each organization’s finances, including overall revenue and expenses, and details such as the number of employees, sources of revenue, and spending. 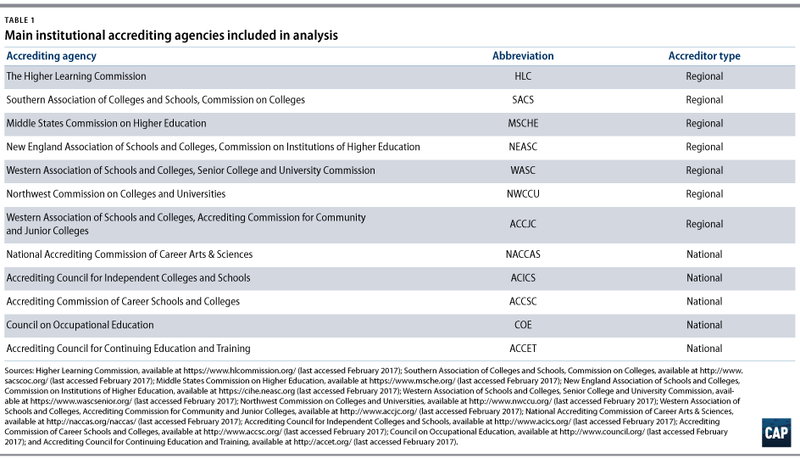 CAP looked at the filings for calendar year 2013—the most recent filing year available—for all 12 institutional accrediting agencies, which include the seven major regional and five national agencies.16 The table below lists each agency, the agency abbreviation used throughout this report, and the accreditor type. Information obtained from the 990 forms used in this report includes annual expenses and number of employees. This analysis also looked at how much each agency charges the schools it oversees and how those amounts are determined. This includes annual membership fees, initial and reaffirmation fees, and substantive change fees. These figures all came from agency websites or correspondence with the agency. However, annual membership fees are not included for the Southern Association of Colleges and Schools Commission on Colleges, which did not respond to requests for information.17 The fees analyzed are from the most recent year available, which in most cases was 2016. CAP’s review found that overall spending on quality assurance is low. Accrediting agencies are small operations that, despite providing access to $120 billion in taxpayer dollars annually, only spend roughly $75 million per year.18 This means that for every $1 accreditors spend on monitoring college quality, they provide colleges access to $1,693 in federal financial aid. Importantly, it is not that spending is low because agencies receive substantial revenue and choose not to spend on quality oversight. Rather, spending on oversight is a function of how little revenue agencies bring in. 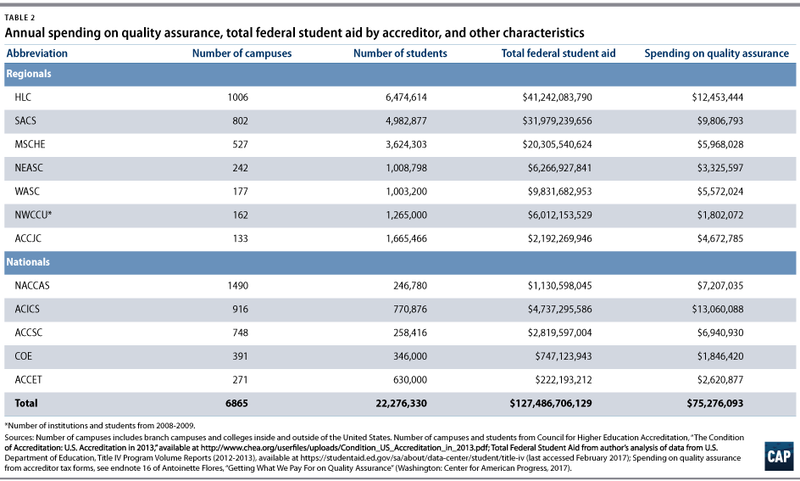 Table 2 provides a breakdown of the total annual federal student aid received by colleges approved by each accreditor, along with each agency’s total spending on quality assurance. While peer review has the benefit of bringing in knowledgeable people to judge a program, it also means accreditors often rely on very small paid staffs. 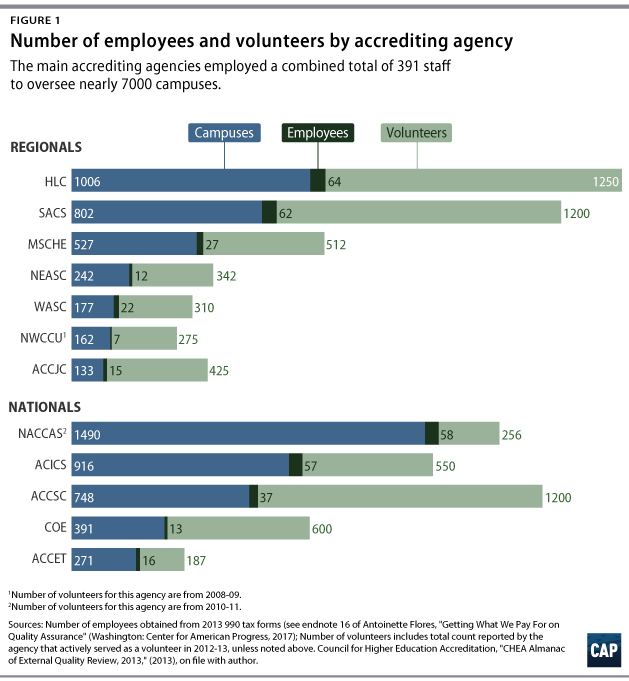 As shown in Figure 1, in 2013, the 12 main accrediting agencies employed 391 staff members to oversee nearly 7,000 colleges. The number of unpaid volunteers conducting quality assurance is 18 times greater than the number of paid employees. When an accreditor is small in terms of both resources and employees, the agency is more vulnerable to colleges that challenge their authority and decision-making, particularly in court. When colleges lose accreditation, they frequently sue their accreditor to delay or overturn the decision.20 While accreditors usually win in court, fighting legal battles takes up valuable time and financial resources and detracts from other duties.21 For example, in 2013, the City College of San Francisco sued its accreditor, the Accrediting Commission for Community and Junior Colleges, or ACCJC, after the agency attempted to revoke its accreditation.22 The ACCJC spent much of 2014 defending itself in court, and tax documents show the financial damage. That year, the ACCJC brought in $3.7 million in revenue but spent $4.4 million, half of which went toward legal fees.23 In the end, a federal judge sided with the City College of San Francisco.24 Negative net revenue as a result of high-cost legal fees diverted money that would have been available to spend toward quality assurance. While overall spending by accreditors is low, average spending per institution varies a great deal from accreditor to accreditor, as shown in Figure 2. For example, among regional accreditors, average spending ranges from almost $11,000 per institution to $35,000 per institution. Among national accreditors, average spending varies from roughly $5,000 to $16,000. To be clear, this does not mean that agencies that spend more on oversight are necessarily better at measuring quality. Instead, it suggests that there is no standard for what is adequate. 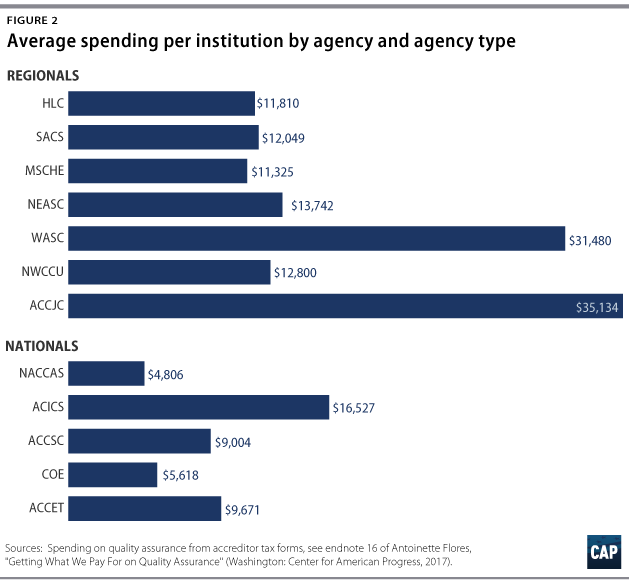 Some of the variation in average spending across agencies may reflect differences in the typical size of the colleges each agency oversees. For example, the National Accrediting Commission of Career Arts & Sciences, or NACCAS, a national accreditor, spends the least—a little less than $5,000 per institution—but many of the schools it oversees are small mom and pop beauty schools with less than 100 students. While it makes sense that agency spending might vary according to the type of colleges it oversees, there are some anomalies. For example, the ACCJC is one of the smallest regionals and accredits community colleges, which tend to have lower resources than four-year schools. However, the ACCJC’s average spending per institution is the highest among all 12 agencies. Another reason for variation in average spending may be a result of how agencies treat travel and lodging fees in their revenue and spending. For example, when an institution has an accreditation visit, the New England Association of Schools and Colleges, or NEASC, charges institutions for evaluator travel, lodging, and meals. However, the money collected is used to reimburse evaluators and is not included in the agency’s overall revenue.25 In contrast, the Accrediting Council for Independent Colleges and Schools, or ACICS, which has the highest average spending among national agencies, collected and spent more than $3 million in travel expenses in 2013. This amount is the highest revenue and spending toward travel among any agency included in this analysis and helps explain why the agency’s average spending seems so high. Because what each agency spends is a function of the money it receives, it is worth taking a closer look at how accreditors determine their membership dues and fees for the schools they approve. A review of these formulas shows substantial differences in approaches. The result is that the same institution would likely pay quite different amounts depending on which agency provides its accreditation. Annual membership or sustaining fees from colleges are the largest source of accreditor revenue. Factors accreditors use to determine these fees generally fall in two categories: how many students the college serves and the college’s wealth. Table 3 shows the factors each agency measures to determine how much a college pays each year for access to federal aid. As a general rule, larger colleges pay more in annual fees. The second factor determining how much colleges pay their accreditor is the minimum and maximum membership fee their accreditor sets. These also vary widely. 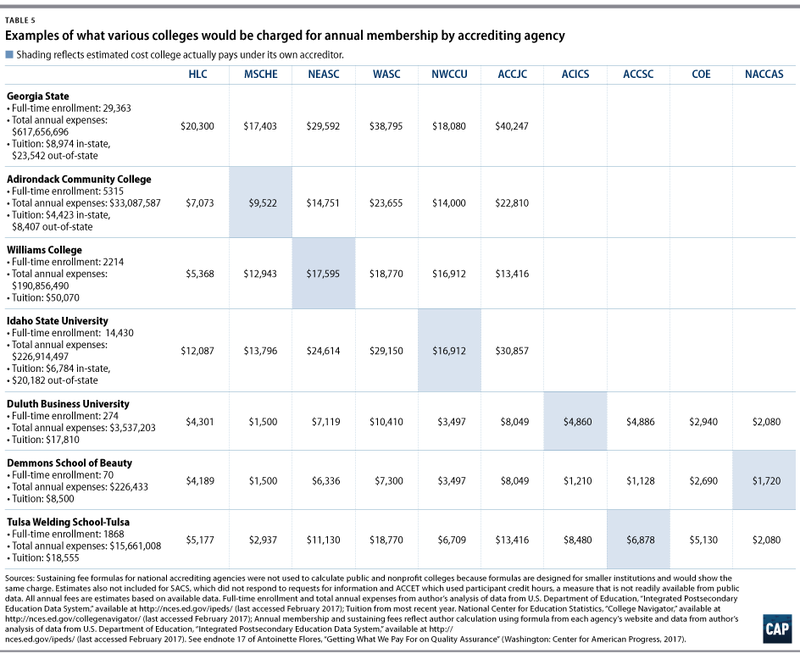 Table 4 shows the range of how much colleges pay under each accreditor. National agencies tend to have lower minimums and maximums and smaller ranges, largely because many of the colleges they oversee are smaller and less wealthy. Based on a review of five national accreditors, minimum annual membership fees across agencies range from $1,200 to $2,723 per institution and maximum fees range from $3,083 to $14,510 per institution, although the Accrediting Commission of Career Schools and Colleges, or ACCSC, has no maximum fee. In contrast, regional agencies have much wider membership fees and higher maximums, likely because they accredit a variety of colleges, including small community colleges and large, relatively wealthy state universities. Among regionals, minimums range from $1,500 to $8,049 per institution and maximums range from $18,080 to $162,055 per institution. One agency—the Higher Learning Commission, or HLC—does not have a maximum fee. The differences in membership fee formulas matter for both the revenue an agency takes in and how much it spends on conducting quality assurance. For example, the Western Association of Schools and Colleges, Senior College and University Commission, or WASC, has relatively high average spending per institution. In general, it charges higher base fees for larger colleges. Similarly, the NACCAS has the smallest average spending per institution because its membership fee formula only considers total number of students, and again, many of the schools it oversees are small mom and pop beauty schools that tend to serve less than 100 students. To get a sense of the implications of formula variations, CAP used each agency’s published membership fee structure and data institutions reported to the U.S. Department of Education to calculate how much various colleges would pay under each accrediting agency, as shown in Table 5. The findings reveal that how much a specific college pays under one agency could double or triple under another agency. For example, Williams College, which serves a small number of students but is relatively wealthy, could pay as little as $5,000 under a formula that only considers size of the student body or as much as $18,500 under a formula that accounts for the wealth of a college. Under its own accreditor, NEASC, CAP estimates that Williams pays roughly $17,500. Regardless of the formula used, the amount that many colleges spend each year to gain access to federal funding is less than tuition for one student. While Williams College’s maximum charge for accreditation is an estimated $17,500, the listed price for tuition for one year is $50,070.26 This discrepancy is particularly obvious among small for-profit colleges. For example, at Demmons School of Beauty, a small school with 70 full-time students, tuition is $8,500 per year.27 Despite that sticker price, the college only pays an estimated $1,720 in an annual sustaining fee for quality assurance. To be clear, despite their differences, these colleges pay little in annual membership fees while taking in significantly larger amounts in tuition. Unlike annual membership fees, which vary by college characteristics, most other charges are flat fees billed when accreditors take specific actions. This includes charges for initial or renewing accreditation and fees to review major changes to a school’s accreditation—such as a change of ownership. 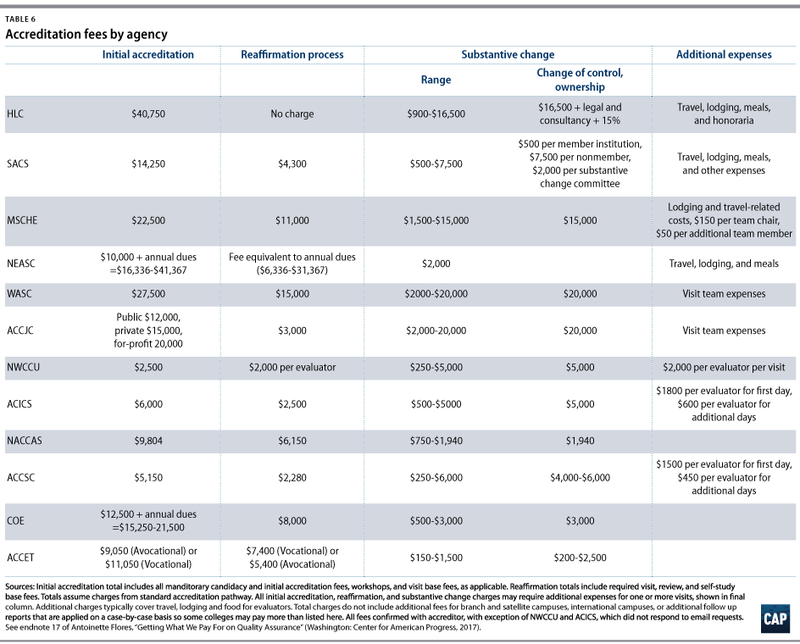 Table 6 lists charges by agency for a range of services. The only variation in how much each accreditor charges are fees for visits, which can include a visiting team’s travel, lodging, and other expenses. Each service is provided when a college needs a performance review. For example, initial accreditation occurs when an unaccredited college wants to become accredited so it can access federal student aid dollars. An agency conducts a review to determine whether the college is of sufficient quality to gain access. Similarly, all accredited colleges must periodically renew their accreditation, called reaffirmation of accreditation. Reaffirmation of accreditation occurs no less than once every 10 years and consists of a review of the college to ensure it is meeting standards. While fees typically do not vary within an accreditor, they can be quite different across agencies—by tens of thousands of dollars in some cases. For example, all regional accreditors charge a higher price than national accreditors for initial accreditation, ranging from a minimum of $8,500 charged by the NWCCU to a maximum of $41,000 charged by the HLC. These base fees do not include travel expenses or other fees for additional evaluators. 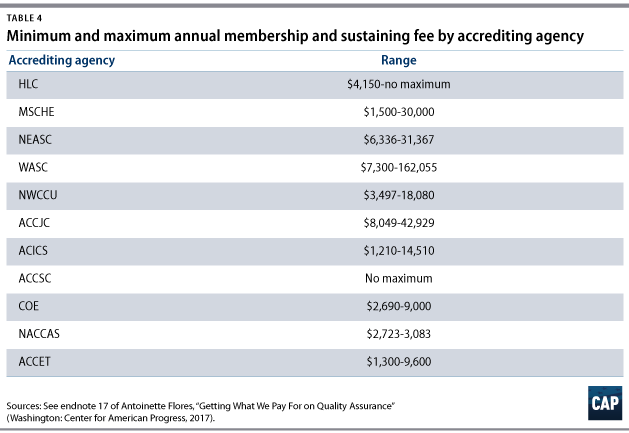 National accreditors have smaller fees that vary from a minimum of $6,000 at the ACICS to a maximum of $19,500 at the Council on Occupational Education, or COE, not including travel expenses. Regional accreditor NEASC and national accreditor COE are exceptions to the flat-fee rule and charge an additional fee equal to each college’s annual membership fee, which makes their initial accreditation generally costlier than most other agencies. Notably, no agency varies upfront fees for annual membership, initial accreditation and reaffirmation, or substantive change based on an institution’s performance. 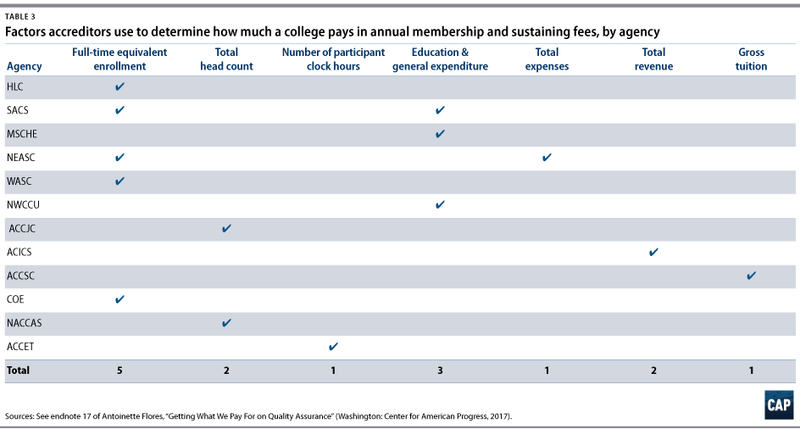 Some smaller colleges may pay very little for membership despite needing more resources to help the college improve. In contrast, some large and wealthy colleges that do not need improvement may pay significantly more. Riskier schools can pay more overall but only if the accreditor takes action. And even when accreditors do take action, charges tend to be small. For example, some colleges that are not performing to an agency’s standard may be required to go through reaffirmation more frequently, which means they pay more overall but not in a given year. The other way agencies vary how much a college pays based on performance is through visit fees. Agencies may require a visit if a college is placed on sanction, if it requests to make a substantive change, or if the agency has reason to be concerned about performance. For example, when a college is sanctioned, the HLC requires a follow-up visit and charges the school $6,400 plus travel expenses. 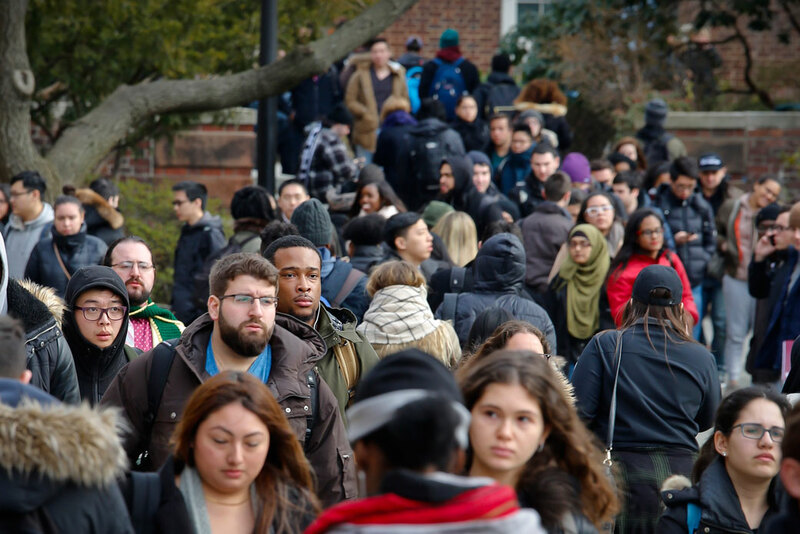 While this can lead to some variation in what colleges pay, the fees are relatively small, mostly go toward travel and expense fees for visitors, and are not a significant revenue source for agencies. In most cases, accreditors act merely as a pass-through for added travel expenses, which go toward reimbursing evaluator travel. These added charges do not function as revenue for the agency itself. A wide range of fees across accrediting agencies and for various colleges means that accreditors have varying resources to put toward quality assurance. To help stabilize resources available to measure and improve quality, accreditors should work together to determine reasonable minimum fees for various services, either in dollar terms or as a share of Title IV money received. For example, the smallest colleges are charged as little as $1,000 in annual membership fees at one agency and as much as $8,000 at another. Similarly, colleges pay a minimum of $2,500 to gain initial accreditation at one agency, while others pay a minimum of nearly $41,700 to gain entry at another. Fixing these large imbalances would help standardize how much each agency can designate toward quality review and improvement. In order to increase revenue available to work with colleges most in need of oversight, accrediting agencies should charge low-performing institutions higher fees based on their risk and need for improvement. While there may already be some variation in what a college pays based on performance, such as when an accreditor requires a follow-up visit, these charges only occur when an accreditor takes action and tend to be small fees that cover travel and lodging of evaluators. In April 2016, the U.S. Department of Education sent a letter to accrediting agencies asking accreditors to vary their processes, investment of resources, and requirements based on a college’s performance.29 Flexibility in reviews and monitoring would both reduce the burden for high performers and allow accreditors to spend greater resources on colleges with poor student outcomes. Accrediting agencies could accomplish this by varying charges and spending based on a college’s performance. Higher-performing colleges with strong student outcomes would pay fees that are the same or lower, while colleges with poor outcomes would pay more. Changing the funding structure could accomplish two goals. First, higher revenue would allow accreditors to hire more staff and focus more time and energy on schools in need of improvement. Second, higher fees and more oversight for low performers would create incentives to improve performance. Accreditors should work to ensure these fees are adequate but not overly burdensome. When an accreditor is up for the renewal of its federal recognition, the U.S. Department of Education and NACIQI must determine whether the accrediting agency has adequate staff and financial resources to carry out its responsibilities.30 Both the Department of Education and NACIQI should establish stronger guidance and definitions for what is considered adequate for an agency to properly carry out its duties. Currently, these reviews look at previous staff levels and revenue to determine what is acceptable. But these reviews do not factor in growth in the number of students or amount of financial aid dollars the accreditor oversees, which may require added resources. To determine what level of financial resources and staffing is adequate, the Department of Education and NACIQI should examine additional factors such as the number of colleges the agency oversees, their relative performance or risk to taxpayers, growth in the student body, the amount of federal money it authorizes, and the number of lawsuits it has had to defend. Accreditors are vulnerable to lawsuits when they exercise their authority to remove a college’s accreditation. But as nonprofit entities, they lack the legal protection provided to the U.S. Department of Education for enforcement. For example, when the Department of Education is sued, attorneys from the U.S. Department of Justice fight the case. Fighting lawsuits takes added financial and staff resources that can bleed an accrediting agency dry. Even the threat of legal action might serve as a disincentive to withdraw accreditation. In order to strengthen accreditor authority to take action when needed without fears of losing all their resources in court, agencies need greater legal protection. As gatekeepers to federal dollars, accrediting agencies serve as an enforcement arm of the federal government and need added support when they are sued. These legal protections must be structured in a way that maintains necessary due process rights for institutions. With these protections, accreditors should face greater federal scrutiny if they fail to take action against low-performing institutions. Accreditors must make sure that federal financial aid dollars are well-spent. But the system is hobbled by a shortage of resources and a lack of flexibility to direct those resources where they are needed most. When private entities are asked to guard federal funds but lack the money to do it well, it should be no surprise that they fail to keep students safe. The federal government invests $120 billion in federal student aid, but accrediting agencies spend only $75 million safeguarding those funds. Congress, accrediting agencies, and the U.S. Department of Education must all do more to ensure these essential gatekeepers can adequately do their jobs and protect taxpayers. Antoinette Flores is a Senior Policy Analyst on the Postsecondary Education team at the Center for American Progress. Her work focuses on improving quality assurance, accreditation, access, and affordability in higher education. The author would like to thank Dr. Barbara Brittingham, president of the New England Association of Schools and Colleges Commission on Institutions of Higher Education, and Dr. Paul Gaston, author of Higher Education Accreditation: How It’s Changing, Why It Must, for providing expert feedback. She would also like to thank Marcella Bombardieri and Ben Miller for reviewing drafts of this report and providing invaluable feedback and guidance.